Sarawakians don’t need silly stories that can be disproved. The Sarawak Report and Bruno Manser Fund Taib-haters divide commentators into two camps. In one camp are those who believe them and attack anyone who dares to question them or check their facts. All others are in the other camp; if these people speak out, they are dismissed as public relations operatives for Taib. No wonder most keep their heads down. Clare Rewcastle of Sarawak Report, in her recent attacks on me, shows that she won’t accept that there could be people who don’t buy her stories, the forgeries and the exaggerations, yet who care deeply about what is being done, irreversibly, to Sarawak – people who despise the arrogance and self-belief of a man who was too long in power, who has a fawning press that long ago lost the ability to ask questions. People like us instinctively distrust these political strongmen. But wait: I am not being clear. I am referring here to Taib, not to Ms Rewcastle’s newest friend, Tun Dr Mahathir Mohamad, at whose invitation she recently travelled to Kuala Lumpur. With Rewcastle passing a copy of Straumann’s book to a confused-looking Dr M, it is hard to work out who is using whom. This must confuse the Western donors who support the Bruno Manser Fund, Global Witness and Sarawak Report. But nothing surprises Malaysians any more. Clare Rewcastle can try to demonise me as Taib’s PR person because it is essential for her self-serving campaign to stop anyone looking too hard at the details of that campaign. But the recent revelations of legal letters in FMT give a snapshot of what is going on behind the scenes. Having needled Taib’s lawyers for months by quoting only slices of their letters, the Bruno Manser Fund stepped on a landmine. The letters showed some of the real issues behind the scenes. Read them here and here. One letter is relatively unimportant. Straumann and the claque of supporters screamed that Taib’s lawyers silenced the BBC, but the letter shows that they didn’t even try. The BBC aggressively attacks the government in Britain, has reported on world wars, and stands up for broadcasting truth to many oppressed people the world over. It was ludicrous to think that a London law firm could “block” or “bully” it. And yet we believed it, because we are used to that sort of thing here. No, the lawyers basically told the BBC that Straumann’s attacks had been disproved, and simply demanded the right of reply. Is that bullying? Let’s guess. 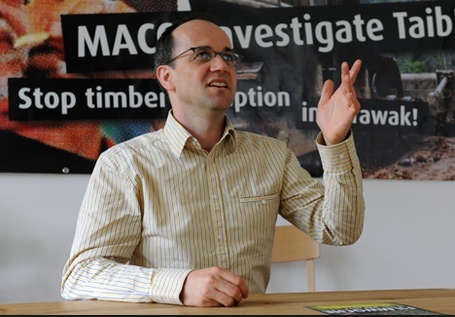 Maybe, in his interviews with the BBC, Straumann never mentioned that his primary attack on money laundering – that Taib has assigned his brother the right to control timber export licences – had already been disproved years ago. It would be consistent. Buy his book and check. He never for a moment admits that the whole allegation was thrown out by the Japanese authorities, and later – in a court process in Malaysia – retracted in full by MalaysiaKini. Given an elegant hint of this by the oh-so-British lawyers, the BBC presumably looked a little harder. If Straumann missed out that inconvenient fact, what else isn’t true? The BBC could start checking. A monopoly on all timber exports? Really? When the whole idea that he may have controlled exports to one country was already discredited? Even by Straumann’s standards that exaggeration is pretty wild. So what does the FBI or BBC (or Canadian Police or Japanese tax authorities or Swiss prosecutors etc etc) do? A bit of research is enough to show that this is a foolish, unbalanced assertion from a foolish unbalanced source. File closed. How does that help Sarawak or Malaysia? How does this help us deal with the legacy of Taib, and his successors’ continuation of his megalomaniac, mega-dam strategy? Tell Sarawakians that 90% of the state has been felled, as Rewcastle and Straumann claim to their foreign supporters, and Sarawakians will laugh. Twisted statistics are unconvincing to those on the ground. What the typical Sarawakian might do is to look thoughtfully at West Malaysia, consider the departure of most of its rainforest, and wonder about the future of his own. He is right to worry. But he doesn’t need silly exaggerated stories that can be disproved and dismissed. He needs a responsible, open government that will tell him what its plan is and allow him to discuss this and vote on it. He needs an opposition with a better, clearer practical plan for development and conservation, not an agenda based upon hate and disinformation. And if this is an international matter at all, he needs advocates who are coolly forensic and taken seriously by the world. Looking at that shopping list, that typical Sarawakian is not currently well served at home or abroad. Winifred Poh has lived in Sarawak for 50 years and is an FMT reader. The opinions expressed in this article are entirely her own. More rope to hang Lukas Straumann?